UPDATE: Councilwoman Cathy Bevins has responded, saying that, based on a county investigation, it was determined the source of odor was leaching at the Honeygo Reclamation Center, which may have been caused by recent heavy rains. In response, Honeygo Reclamation Center has added a liquid chemical compound (Sodium Permanganate) to address the odor. After the initial application and a brief period to allow the liquid to disperse, operations at the HRC will continue. The Department of Public Works is in close contact with the private owner of this landfill and will stay on top of the matter until it is resolved. That’s what many residents in the White Marsh area have been asking lately. 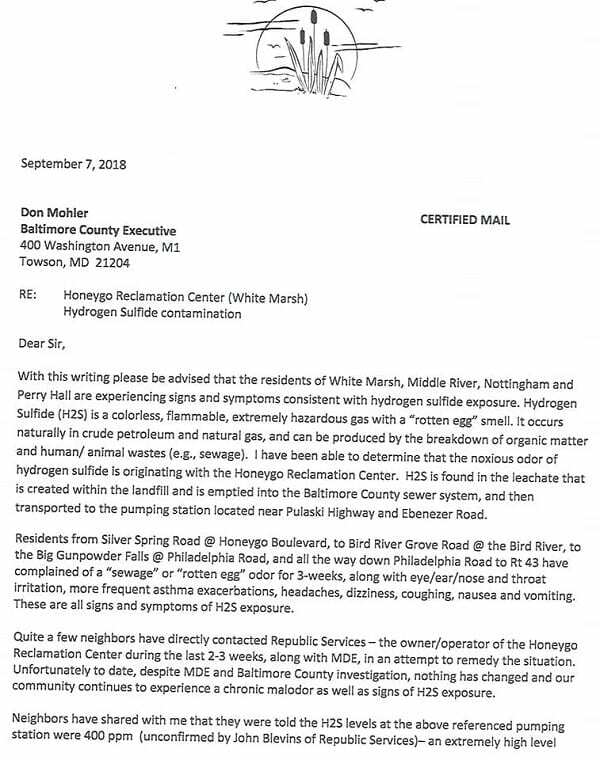 Last week, the White Marsh-Cowenton Community Association posted to Facebook asking citizens if they noticed the smell and asked if they were suffering any ill effects such as headache, nausea, etc. 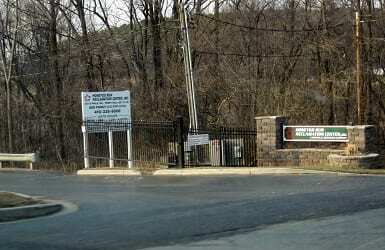 After many local residents replied that they had, in fact, noticed the odor – which seemed to be emanating from the Honeygo Reclamation Center – the WMCCA reached out to local officials expressing concerns about the “rotten egg smell,” which they suspect may be due to excess levels of hydrogen sulfide, a substance found at many landfill sites. County Executive Don Mohler and Councilwoman Cathy Bevins have asked the Department of Environmental Protection and Sustainability to investigate in order to ensure that there are no public health impacts. Councilman David Marks has stated that his office is investigating as well. 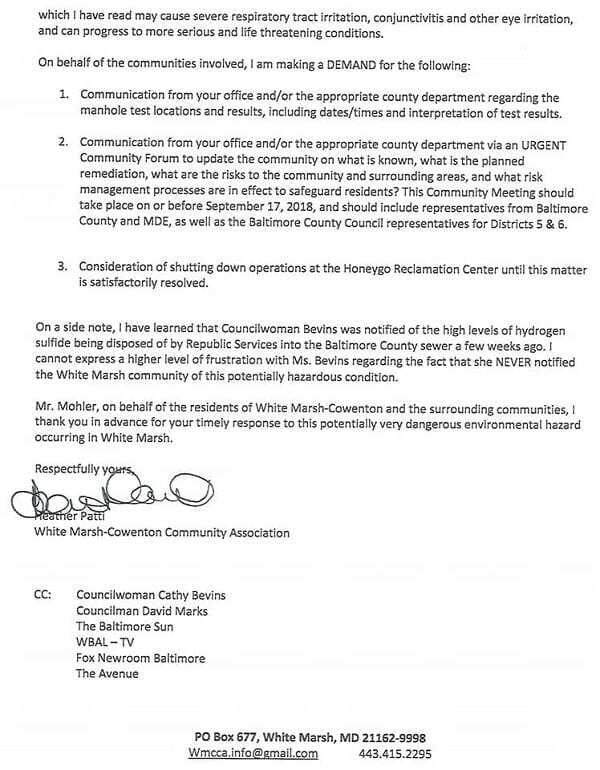 A copy of the letter sent by Heather Patti of the WMCCA to County Executive Don Mohler’s office can be found below.